The Three Stooges in the first anti-Nazi parody, where Moe plays the Dictator Hailstone, with help from Larry and Curly – can the beautiful spy Mata Herring stop them? The Three Stooges are inept trail guides, trying to get a troupe of female entertainers through the American wilderness … until the girls are kidnapped by Indians! The Stooges’ friend Jerry tries to get them to commit insurance fraud, by pretending that Curly think that he’s a dog – but Dr. Vernon Dent wants to operate! The Stooges go from being on the run to census workers who “help” at a society party, ending with them “infiltrating” a college football game! The Stooges are on the run from a jealous husband and unintentionally join the Army — and their sergeant is none other than that jealous husband! The Three Stooges get hired to find an honest man — and they end up looking for him in prison, and try to paint their way out in a prison break! The Three Stooges are photographers for Whack magazine (“If it’s a good picture it’s out of Whack”), who mess up the assignment of taking photos of a movie star and his new bride. As “reward,” they are sent to the country of Vulgaria to get a photograph of the Vulgarians’ death ray – the Stooges are caught and sentenced to the firing squad. For Curly’s last request? A giant cigar, in order to out-last the firing squad. All the World’s a Stooge – in order to escape the police the Three Stooges pose as child “refugees” and drive their new family crazy! The Three Stooges are inept ice deliverymen, who keep ruining Vernon Dent’s birthday cake — and that’s before his wife hires them as cook and butlers! One of the Three Stooges best short films, where three lovely young ladies need to be married in order to collect their inheritance, so they marry three death row inmates (Moe, Larry and Curly – imprisoned for a crime they didn’t commit). But the Stooges are released at the last moment, and their new brides are determined to find a cause for divorce, so they throw a large society party, leading to one of the best pie fights ever filmed! Moe, Larry, and Curly abandon a scheme to defraud a hotel, once they realize the little old lady who owns it is in trouble – and after some disastrous remodeling, they try to entertain the guests and are failing – until Curly puts on magician Vernon Dent’s coat by mistake! A Western short film starring the Three Stooges. After a hilarious “morning routine”, the Stooges’ mother throws them out of the house to make their way in the world. The Three Stooges decide to use Curly’s invention, a gold collar-button finder, to become prospectors, after being swindled into buying a worthless gold mine. They actually succeed, only to have to hide from claim jumpers, leading to a hilarious scene with the boys hiding in a ghost town hotel, with Moe, Larry, Curly and a lit stick of dynamite! The Stooges take their fake bull-fighting act to Mexico, but irritate a jealous husband, who makes sure that Curly’s facing a live bull in the arena! Set in ancient Rome, the Stooges are used chariot dealers who have to rescue a beautiful young maiden from Emperor Octavius Grabs! The Three Stooges find a foundling on their doorstep, and do their comic best to feed — and change — the baby, only to realize that the child’s been kidnapped! The Three Stooges–political satirists? Laugh if you will, but as demonstrated by the shorts “You Nazty Spy” and “I’ll Never Heil Again“–both of which are featured on this two-disc, digitally remastered set–the boys were the first act in Hollywood to bring attention to the Nazi threat in the days prior to America’s involvement in World War II. “Nazty,” which was released in 1940 some nine months before Chaplin’s The Great Dictator, and 1941’s “Heil,” have Moe donning the greasepaint mustache to play Moe Hailstone, a dull-witted wallpaper hanger who runs amok as the dictator of Moronica along with his sidekicks Larry (the Goebbels stand-in) and Curly (Mussolini, natch). The Golden Age of the Three Stooges continues in this exceptional third chronological collection. These 23 shorts from 1940-1942 are all digitally remastered for the highest quality in sight and sound, and this collection is even more special as it features an historical first: Moe Howard was the first American to portray Hitler on film, in 1940’s “You Nazty Spy“, which was Moe’s personal favorite. It also contains the outstanding 1941 sequel, I’ll Never Heil Again. Moe as a vicious dictator – who would have thought?! With biting satire and merciless wit, the Three Stooges gave the world a brave new perspective on the absurdity of evil and the world powers of the time. This collection also contains Curly’s favorite, “A Plumbing We Will Go“, which features the brilliant sight gag of a burst of water flowing from a new television set just as it’s broadcasting a live report from Niagara Falls. 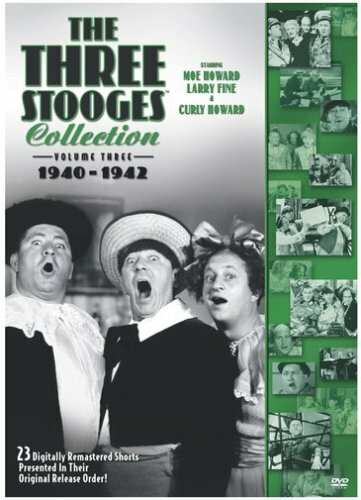 The Three Stooges Collection Volume Three will soitenly keep you entertained as Larry, Moe, and Curly portray a variety of characters in their own inimitable way.